Seven years ago, I completed my first Ironman after being diagnosed with stage 4 COPD. This race changed the way I thought about my disease. My motto of “Never Let Your Disease Define You” was born from that race. Two years later I went on to complete two more Ironman events. Since my last Ironman in 2014 I have focused more on marathons to raise awareness and funds for COPD. In May 2017 I contracted an infection which resulted in my worst exacerbation since my diagnosis. This exacerbation has impacted on my oxygen saturations which has resulted in slower marathon times. Trust me, I still feel privileged I can participate in races no matter how slow I am. After having oxygen saturation issues during the Gold Coast marathon last year, I have wondered if my race days were coming to an end. 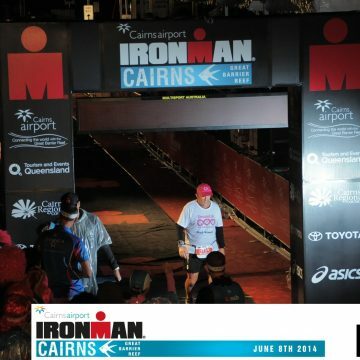 Towards the end of 2018 my wife Leanne floated the idea of doing another Ironman. At first, I was a little daunted by the prospect of swimming 3.8 kilometres, cycling 180 kilometres and the running 42.2 kilometres within 17 hours. But then I thought, what a challenge! Yes, I have completed 3 Ironman events previously, but I have never had to use oxygen in any of those races. So now I face the prospect of racing the worlds toughest one day event with an oxygen concentrator strapped to my back. But why not!! As the saying goes, to build resilience you have to take yourself out of your comfort zone, and I want to build as much resilience as possible. While I believe personal goals are a cornerstone of managing COPD well, this race is also about raising funds for research and awareness of COPD. As far as I’m aware no COPD patient has ever completed or attempted Ironman with oxygen. So I figure it will be a great opportunity to shine a light on our disease. Every major race I have completed I have had to have clearance from my doctor and the race medical director. This race has been different as I have also had to gain clearance to race with an oxygen concentrator. The Ironman organisation have never had to grant this type of approval. After months of correspondence I received race clearance for my oxygen concentrator, first hurdle overcome! At the time of writing this article I have another 19 weeks until race day, 19 weeks of blood sweat and tears! As always with Ironman there are no guaranties. So many things can go wrong when you are asking so much of your body. Race preparation and managing my disease is paramount to ensure I make it to the start line. Ironman training is a huge load on your body and puts plenty of pressure on your immune system. However, I have gained a lot of knowledge over the years about what my body can tolerate and what works for me. My four pillars of living well with COPD will be my strategy for getting through this next challenge – Knowledge, Medication, Nutrition and Exercise. My hope is when the race is over, I would have raised some awareness for COPD, raised some funds for research and shown me my race days are far from over! I’ve included a short video to give a sense of what Ironman is, wish me luck! Are you collecting sponsorship online? If so – do you have a link to this – sorry but I can’t seem to find it on the website! Hi Sarah, I do have an online sponsorship link -https://lungfoundation.grassrootz.com/run-for-lungs/copd-athlete Appreciate your support! Hi Barry, Keep dancing, it’s great exercise. As far as suggestions – diet is key with COPD. Eat clean and no processed foods, have a look at my articles on nutrition.